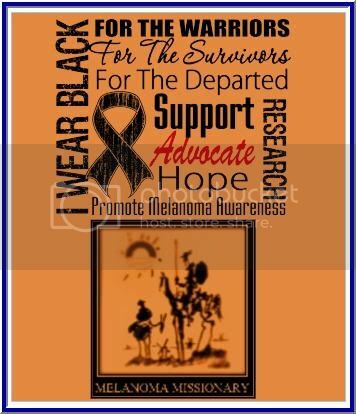 Metastatic melanoma historically has had a very poor prognosis with a median survival of 6-9 months. However, recent advances in molecularly targeted therapy as well as immune based therapies have provided several effective treatment options for oncologists and their patients. In 2012 there are several important issues to consider in the management of patients with newly diagnosed advanced melanoma. •Another option we have offered is a short course of systemic therapy for 6-12 months prior to surgery with the intent to improve the chance that rapid recurrence of disease does not occur and to define the tumor’s responsiveness to the treatment. •Patients should be considered for clinical trials in the adjuvant setting. Studies are ongoing to assess whether ipilimumab or vemurafenib is effective in preventing recurrences in high risk patients. For stage IV (M1) disease after complete surgical treatment there is no standard of care adjuvant treatment. •Interferon, the current standard of care for fully resected stage IIb-III disease, is also an option in the adjuvant setting. •All patients with metastatic disease should undergo testing for BRAF V600 mutations given the availability of targeted therapy for this mutation. This should include testing for the alternate V600 mutations that make up about 20% of BRAF mutations at this codon and appear sensitive to the BRAF inhibitors such as vemurafenib and dabrafenib.2 Patients with advanced local or regional disease can also be considered for testing since there are a number of clinical trials either recently or soon to be activated with BRAF inhibitor based therapy in BRAF V600 mutated melanoma at stage IIC-IIIC. Additionally, results will be available on progression so that therapy can be rapidly initiated if needed. •Responses are often rapid and dramatic. If patients with mutated BRAF V600 melanoma are highly symptomatic, vemurafenib would be our first line therapy in nearly all such patients. •Patients will inevitably progress or relapse, often within the first year. Strategies to prevent or delay resistance are being pursued. In fact, recently the addition of a MEK inhibitor, trametinib, demonstrated an ability to improve the frequency of objective responses and the duration of progression-free survival in those melanoma patients receiving dabrafenib (BRAF inhibitor). •Secondary squamous cell carcinomas are common in BRAF inhibitor trials (10-25%).7 Suspicious lesions should be biopsied. Additionally, secondary melanomas and CMML have been reported in the presence of vemurafenib; almost certainly the drug has played a role to accelerate the appearance and growth of these tumors. •Tumor burden on exam or on imaging may transiently worsen even in patients destined to respond. We do not repeat imaging until after 12 weeks of therapy unless the patient develops concerning new or progressive symptoms. •Since even responding patients may have tumor growth or slow shrinkage, we are hesitant to use this therapy in highly symptomatic patients, especially if there are reasonable alternatives. •Autoimmune side effects may be severe. Colitis, hepatitis, dermatitis, neuropathy, and endocrinopathies are the most common toxicities. •Patients should be monitored closely for colitis. Concerning symptoms (diarrhea, melena/hematochezia, abdominal pain) require rapid evaluation. Though Imodium is appropriate for mild diarrhea (grade I), grade II toxicities or worse require prompt initiation of steroids. Colonoscopy should be performed to confirm the diagnosis in patients with severe colitis. Bowel perforation and death have been reported in extreme cases almost always when initial therapy is delayed. •Headaches, with or without vision changes and fatigue may represent hypophysitis. Evaluation of TSH, cortisol, and testosterone, and brain MRI can aid in this diagnosis. •We monitor TSH, cortisol, and liver enzymes at every visit. •Other rare immune mediated side effects such as Guillan Barre syndrome, myasthenia gravis, sarcoidosis, and hemophilia have also been described. •Though newer agents exist, IL-2 has the most long term data showing durable remissions in the minority of patients. We still consider this therapy in interested, eligible patients. •Advantages of using IL-2 compared to ipilimumab include longer duration of use and more rapid assessments of benefit (8 weeks vs. 12+ weeks). Advantages to ipilimumab include outpatient use, generally less severe side effects, and possibly higher rates of durable remissions. •Dacarbazine, temazolamide, and carboplatin/paclitaxel occasionally benefit patients with metastatic disease. •No consistent survival benefit has been demonstrated with cytotoxic chemotherapy. Response rates are typically in the 5-10% range. 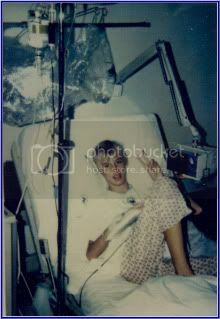 •We use chemotherapy only in patients who are not eligible for other therapies. Which therapy should be chosen as first line therapy in patients with BRAF V600E/K mutations? •This decision should be individualized. No head to head comparisons have been done with immunotherapy in the form of ipilimumab or interleukin-2 therapy. BRAF inhibitors are associated with high response rates but inevitable progression, while immune therapies have low objective response rates but durable remissions in a minority of patients. •In patients with rapidly progressive or highly symptomatic disease, we typically use vemurafenib. In patients with asymptomatic disease, we favor immune based therapies for interested patients. An intergroup randomized cross over trial will address this issue, where half the patients start with vemurafenib and the other half on ipilimumab. Therapy for metastatic melanoma is rapidly evolving. Many clinical trials are ongoing, and patients should be encouraged to participate in clinical trials for first line therapy or at progression if treated with standard therapy options. Some therapies that are likely to be approved are listed below. •BRAF/MEK inhibitor combination therapies: Dabrafenib (BRAF inhibitor) and trametinib (MEK inhibitor) have both shown benefit individually over dacarbazine in phase III trials in patients with BRAF mutant metastatic melanoma. However, interest lies especially in combination therapy to delay resistance and disease progression. In a randomized phase II trial, combination therapy was associated with an improved objective response rate (54% vs 76%) and progression free survival compared to dabrafenib alone (9.4mo vs. 5.8mo).11 Additionally, the incidence of squamous cell carcinomas was dramatically decreased with combination therapy. Trials are ongoing comparing this combination with vemurafenib in untreated patients with BRAF mutations. An additional trial is evaluating vemurafenib in combination with GDC-0973, a MEK inhibitor. 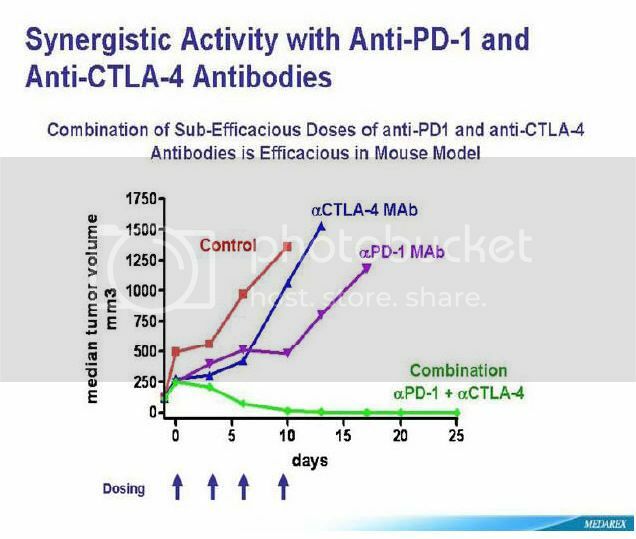 Several newer checkpoint inhibitors block the interaction between PD-1 (expressed on T-cells) and PD-L1 (expressed on tumor) which activates the immune system, hopefully in a tumor specific manner. A phase I trial with nivolumab (anti-PD1 BMS) data shows a 31% response rate with fewer autoimmune side effects than ipilimumab.12 Pneumonitis was described in several patients. Trials are ongoing in patients who have progressed on ipilimumab. Early reports of another anti-PD1, MK-3475 also show a remarkable response rate in patients either following Ipilimumab or de novo in the 40-50% response range. By using both Checkpoint inhibitors, you and block two pathways that the melanoma can't use for immunosuppression. This allows the activated T-cells to go unchecked and keeps the immune response switch on. This clinical trial is ongoing at Sloan Kettering, and Yale. Rumor has it that they are seeing high response rates. Sosman JA, Moon J, Tuthill RJ, et al. A phase 2 trial of complete resection for stage IV melanoma: Results of Southwest Oncology Group Clinical Trial S9430. Cancer 2011. Lovly CM, Dahlman KB, Fohn LE, et al. Routine multiplex mutational profiling of melanomas enables enrollment in genotype-driven therapeutic trials. PloS one 2012;7:e35309. Carvajal RD, Antonescu CR, Wolchok JD, et al. KIT as a therapeutic target in metastatic melanoma. JAMA : the journal of the American Medical Association 2011;305:2327-34. Devitt B, Liu W, Salemi R, et al. Clinical outcome and pathological features associated with NRAS mutation in cutaneous melanoma. Pigment cell & melanoma research 2011;24:666-72. 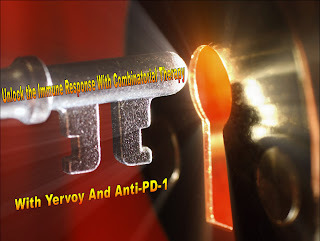 ASCO 2012 was PD-1’s debutant ball, but we may have found a partner (Yervoy) at this Year’s 2013 Ball and may be only a few years away from its coronation (FDA’s approval) as a stand alone or combinatorial therapy. 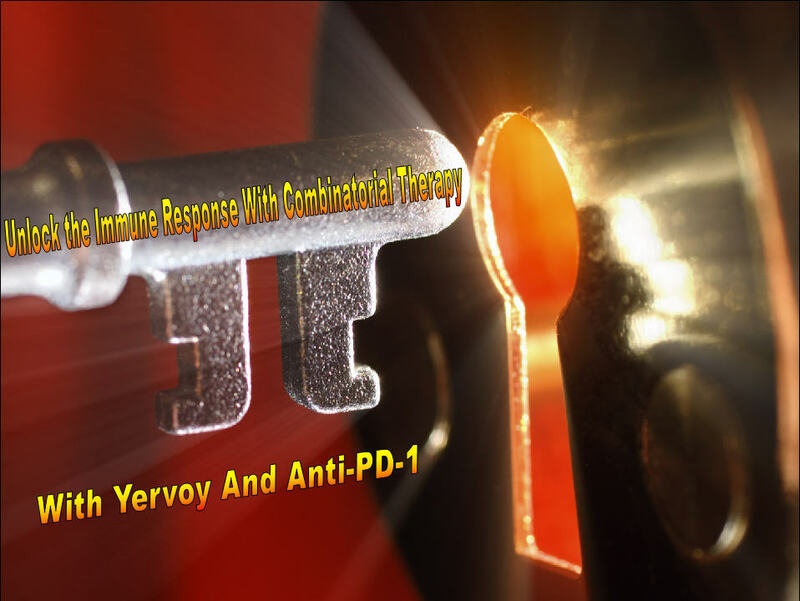 I believe that ASCO 2013 will be the coming out party for combination therapy of Anti-PD-1 + Yervoy. 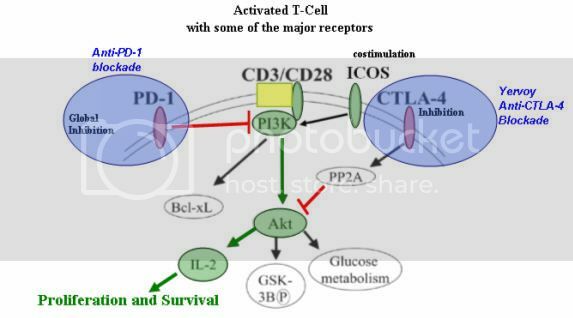 Using this combination blocks two checkpoint pathways on the T-Cells leaving it activated to proliferate and destroy the cancer.